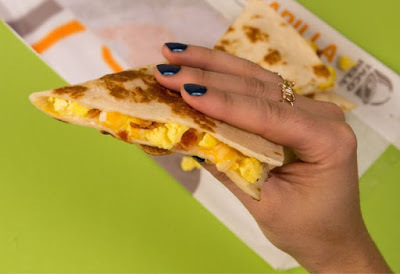 Taco Bell adds the new Breakfast Quesadilla to their morning menu as a bigger, grilled version of their Breakfast Soft Taco. It also provides an alternative to the Sausage Flatbread Quesadilla. The new item goes for $1.99 and consists of bacon or sausage crumbles, egg, and 3-cheese blend grilled/pressed in a folded flour tortilla. A steak version is also available for $2.79 (may vary).